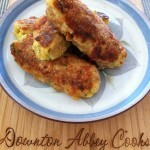 Glamorgan sausages are a traditional Welsh dish. Eaten hot they are great as part of brunch or breakfast but they also great as part of high tea, or cold at a picnic or garden party. Combine the bread crumbs, cheese, leek, parsley, mustard, salt and pepper in a large bowl. Add the one egg and the additional egg yolk and mix thoroughly. Make 8 balls, about 1 1/2 tbsp. each and roll each ball between your hands to make a sausage/cigar shape, about 4 inches long. Beat the remaining egg white until frothy. Place the egg in a shallow dish and flour in another. Dip each sausage in the egg white, then roll in the flour. Heat the oil and butter in a non-stick skillet. Add the sausages, turning to get brown on all sides for about 8 minutes. Don’t cook too long or the cheese will start to ooze through. Yes, there were vegetarians in the Edwardian era, and like other vegetarian dishes which came out of the era, they are made to look the meat version. While exact dating is a bit tricky we can point to Wild Wales, published in 1862 where the author, George Borrow, wrote about the treat: “ The breakfast was delicious, consisting of excellent tea, buttered toast, and Glamorgan sausages”.